Dr Sirajuddin (fourth left) and Amnah (third left) pose with representatives of companies who have signed up for the HADIC system. KUALA LUMPUR: Serunai Commerce Sdn Bhd (Serunai), the developer behind the Global Halal Data Pool as well as the Verify Halal app, recently announced the launch of a blockchain-powered Halal digital chain, HADIC, which aims to create an integrated and secure digital halal ecosystem. The blockchain is expected to seamlessly connecting components throughout the halal value chain. 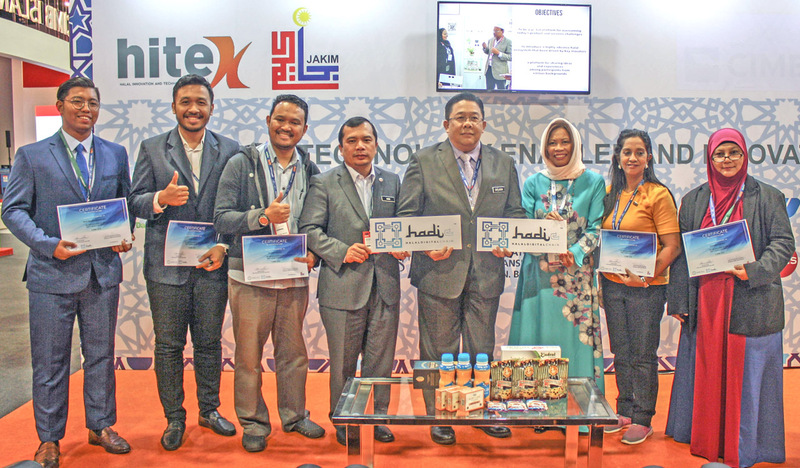 The soft launch was inaugurated by Datuk Dr Sirajuddin Suhaimee, director of Malaysian Halal Council, at Jakim’s HITeX zone during the 16th Malaysia International Halal Showcase (MIHAS) 2019 at MITEC. Speaking to reporters, Dr Sirajuddin Suhaimee, director of the Halal Hub Division, JAKIM, said, “JAKIM is pleased to support HADIC, and we hope to embed its adoption nationally and as well as internationally. “The ecosystem that HADIC will bring about sits in line with JAKIM’s ongoing expansion as well as recognition and connection to global certification bodies. With blockchain, the integrity of product information is secured, and that provides a systemised and highly visible traceability platform. According to Serunai’s chief executive officer Amnah Shaari, HADIC will eventually evolve into an end-to-end interface and fulfil all aspects of the market, from verification and supply chain traceability to consumer insights and secure payments. “The HADIC system allows for a harmonisation of the global halal economy, which is presently fractured due to the numerous players in the market. By digitising the industry via a blockchain system that creates a secure and chronological chain of information across the entire supply chain, the industry will reach exponential heights in further developing and progressing the global halal market and the adoption of halal standards as a worldwide mark of quality, dependability and excellence,” she added. HADIC will serve as the secure digital expressway that connects the numerous databases along the supply chain via multiple ledgers secured by blockchain, allowing users to leverage on the system’s secure connections and interface to easily join the global halal digital chain. Being connected to HADIC will also mean that providers of halal products and services will be part of the Global Halal Data Pool, providing direct access to buyers and sellers in over 42 international markets. The system also integrates with the Verify Halal app which provides users with instant verification of a product’s halal status as well as a fully traceable supply chain. Additional social elements such as geotagging, comments, ratings and data analytics will provide users with a fully integrated commerce and business intelligent network designed to easily navigate the digital halal economy. One of the stand out features of HADIC is the generation of unique QR codes that could be utilised such as barcodes to track and provide buyers, sellers and retailers with in-depth, up-to-date and actionable information about the product or service. HADIC would also foster transparency by allowing tracking and supply chain traceability of halal products and services, benefiting numerous industries and the end consumer. HADIC could improve business processes and efficiency by identifying and flagging any production or regulatory issues throughout the supply chain in a systematic, step-by-step manner, from farm to fork and beyond. The event also saw the first sign-ups for the HADIC system, who were awarded their certifications from Dr Sirajuddin. These pioneering companies include Munif Hijjaz Marketing Sdn Bhd, Eraf Empayar Sdn Bhd, MFAEZ Bakery, The Dalucia Sdn Bhd and SG Sales services Sdn Bhd. HADIC is developed by Serunai and is supported by JAKIM. The system is linked to the International Halal Authority Board (IHAB), the Global Halal Data Pool (GHDP) and integrated with the Verify Halal mobile App.